Sure, it may seem like every publication under the sun has come out with an iPad app, but that may not work for those of us who like to mix and match our news. Thankfully NewsGator, maker of NetNewsWire, has developed a version of its popular desktop and iPhone RSS application for the iPad. The visual interface for NetNewsWire has been completely overhauled and, according to the developer, so has the underlying code. The screen real estate is crisply divided in two: on the left, a column for articles; on the right, the stories themselves. A button in the left column summons a popover that allows you to mark that section as read, while icons to the right give you sharing options. 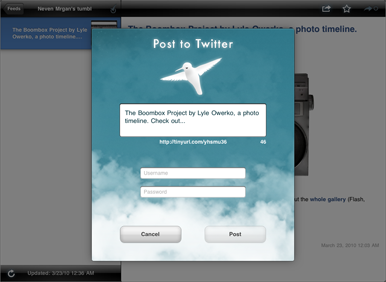 Users can e-mail a story, post a link to Twitter, save it to Instapaper, or open it in MobileSafari. You can also mark an article as a favorite. NetNewsWire also offers a built-in browser for reading stories; you can access it by tapping on any link, including an article’s headline. Move from one story to the next by navigating via the column to the left, or tapping on the arrow in the top right corner. NetNewsWire for iPad is currently on the App Store for $10 during the month of April (come May 1, the price increases to $15). It requires an iPad running iPhone OS 3.2 or later.